Support Center is Coming to Divi! We value your time and work, that’s why we’re constantly aiming to make your design and development process easier. One of the things that’ll bring you one step closer to having complete control over your projects is the upcoming Support Center. We know that everyone needs help once in a while–even the most experienced professionals out there. Having good support at your disposal is a vital part of that process. Which is why we’ve placed help videos throughout Divi. And why we recently updated our support system to live chat instead of a forum. On top of all that, there are several amazing Divi communities out there with members who are willing to help out when you have questions or are struggling with tricky issues. But we’re always looking to raise the bar. Joining this rich pool of resources in the near future will be the all new Support Center, which will make our support and resources more useful and more accessible than ever before. Including a few new support features that we think you’ll really love. Divi’s upcoming Support Center will make it quicker and easier than ever to get the support you need. 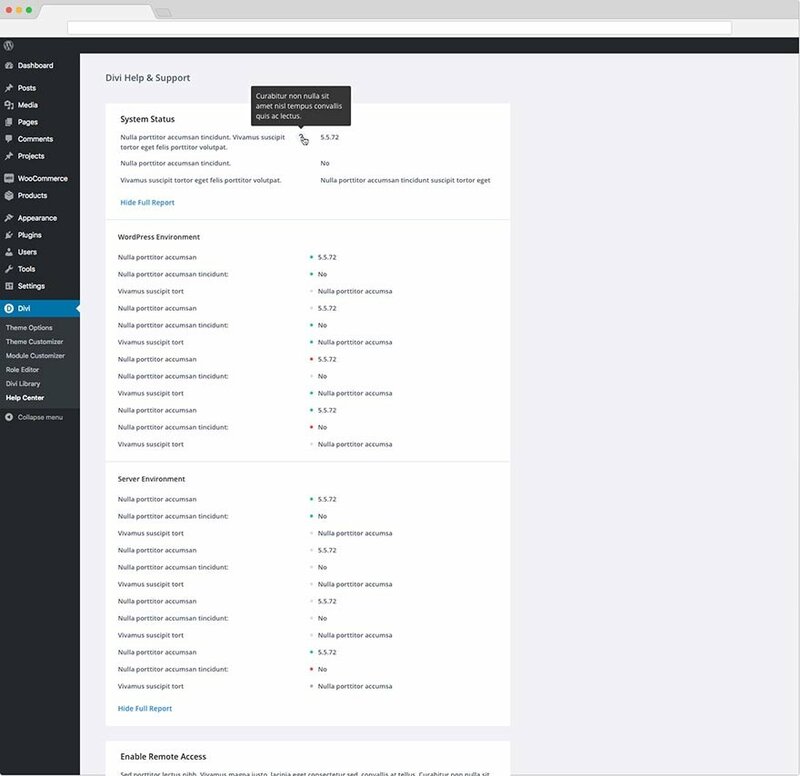 The Support Center, which will exist right in the backend of your WordPress website, will come with some exciting new features. Here’s what you can expect! Some things are best understood when seen with the eye. We’re planning on integrating remote support access in our Support Center that will help you show the exact issue you’re dealing with to our support staff in real-time. This will allow our support team to quickly act upon your issues and solve them faster than ever before. Keeping track of what’s going on with your website behind the scenes can make a big difference. The System Status feature will allow you to see what might be causing problems on your Divi website. It will inform you if there are compatibility issues with your hosting environment, for instance, and it will give you an up-to-date view on how your website is doing. We want you to be able to access the necessary documentation and resources we offer without having to browse endlessly. 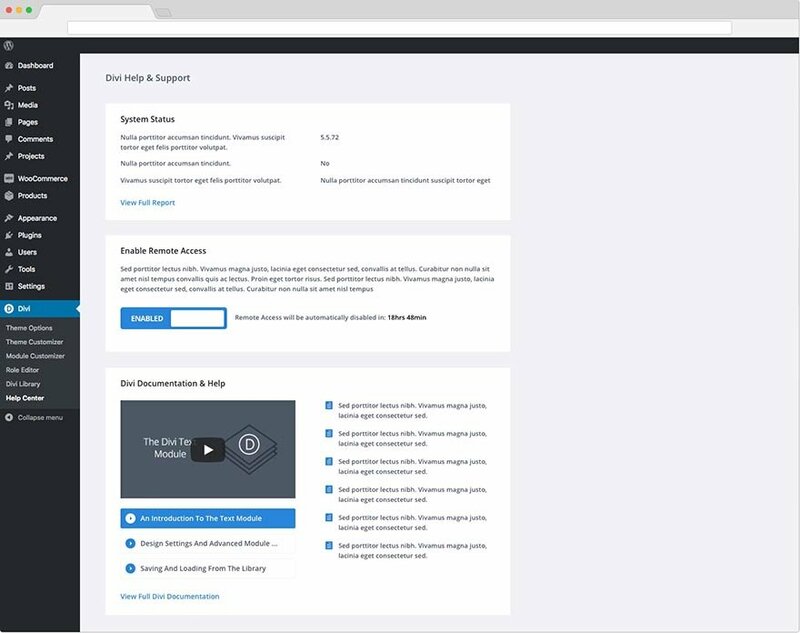 With the new Support Center update, all the relevant resources you need will be within reach from within your website–giving you the user experience you deserve. Our focus will always be on improving your experience, even in ways you might not have imagined before! Every feature that comes out plays an important role in your daily routine and growth as a designer (or business). We’re looking forward to seeing how the Support Center update will help the community take their work to the next level. Make sure you check back with us next week for more Divi awesomeness and let us know what you think of this upcoming update in the comment section! The post Divi Feature Sneak Peek: Support Center appeared first on Elegant Themes Blog.